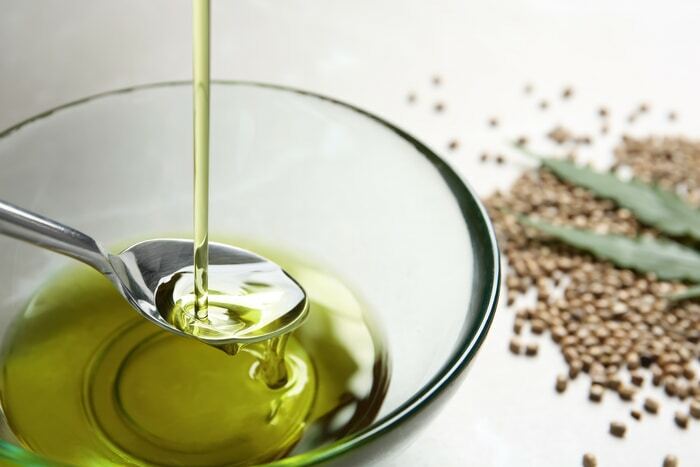 Hempseed oil, also commonly known as hemp oil, is derived as a result of cold pressing hemp seeds. Coming from the seeds of the hemp plant, hemp oil has a distinct nutty flavor and is green in color. You would find a lot of people confusing CBD oil with hemp oil. However, the difference is that CBD oil extracted using the flowers, stalk, and leaves of the plant while hemp oil comes from the seeds of the plant. Yet another much-debated factor about hemp oil is the presence of THC in it. Since hemp oil is extracted from the seeds of industrial hemp, it has almost no THC in it. Industrial hemp plants are grown specifically for making hemp oil products. Thus, it’s ensured that they contain no THC or at least less than 0.3% of THC in them. Hemp oil has a number of benefits, out of which, its therapeutic properties for the skin are becoming quite popular. This is why many skincare brands are using hemp oil as one of the active ingredients in their products. With that being said, here’s why you would find hemp oil in various products, like facewash, lotion, etc. One of the primary issues that people face while buying a skincare product is not being able to find one that goes well with their skin type. People who have dry skin or oily skin can’t just buy any product since choosing the wrong product can cause a lot of problems. Ingredients like hemp oil can help in making a product suitable for almost all skin types, which is why you may see hemp oil as one of the ingredients in your products. Hemp oil has the ability to moderate oil production. This means if your skin produces too much oil, hemp oil can get that under control or if your skin is too dry, hemp oil can moisturize your skin and get rid of the dryness. Most of the time, acne is caused when the pores on your skin are clogged. Hemp oil has the ability to moisturize the skin without clogging the pores which makes it suitable for acne prone skin. Hemp oil is used as an ingredient in products that claim to soothe acne and also, to prevent any further development of acne. This is because hemp oil contains certain compounds like gamma-linolenic acid (GLA) that have anti-inflammatory properties and functions. Thus, hemp oil can reduce the inflammation in acne, causing the acne to shrink. Furthermore, hemp oil also regulates the generation of new cells and skin growth along with moisturizing the skin. These characteristics of hemp oil can help in dealing with acne and other skin problems. Certain skin conditions, like atopic dermatitis, also known as atopic eczema are characterized by skin inflammation, redness, and itchiness from flaky and cracked skin. Hemp oil can help a great deal in reducing the symptoms of such skin conditions, thus promoting healing. In the case of atopic eczema, hemp oil can moisturize the skin, thus reducing the cracks and flakiness. This helps in getting rid of the itchiness and redness in the skin. As already mentioned, hemp oil also has certain compounds that reduce inflammation. Since atopic eczema is characterized by inflammation, hemp oil can be an amazing ingredient to include in products that can be used for such conditions. You would also find hemp oil as one of the ingredients in various products that claim to have an anti-aging effect on the skin. This is because hemp oil has the ability to reduce wrinkles and fine lines. It further helps by preventing the development of signs of aging. Hemp oil contains certain compounds that are not typically present in our body, for instance, linoleic acid and oleic acid. However, they have anti-aging properties and the ability to regulate skin health. This makes hemp oil one of the active ingredients in skin products that are meant for women in their 30s who are trying to prevent the signs of aging and want to slow down the process of aging. As already mentioned, hemp oil is an ingredient that can be found in many skincare products. That is how many people use hemp oil on a daily basis. However, if you wish to use hemp oil exclusively for the benefits that have been mentioned, you can even use it directly on your skin. But before you apply hemp oil directly on your skin, do a patch test so you can be sure there are no side-effects. If all goes well and there are no side-effects, you can apply hemp oil topically to your skin. After leaving it for a couple of minutes, wash it off with warm water. You can also mix hemp oil with many other essential oils for additional benefits. When you buy a hemp oil product or hemp oil, make sure it comes from a trusted brand. As already discussed, hemp oil may contain THC in it, and if it does, it’s not recommended to use that product. So, look for a trusted brand when you buy hemp oil. Hemp oil is also available in a number of other forms, like capsules, lotions, or even edible oils. These can be used for various other reasons as well since the application of hemp oil is not just limited to skincare. Hemp oil capsules can be used as a daily supplement as it has the ability to regulate mental health among its many other therapeutic properties. It’s really amazing how hemp oil is clearly becoming more popular. However, there is still much confusion surrounding the quality of hemp oil and how to choose the right product. While we know hemp oil can be beneficial to our health, it would only be so if you buy a quality product and use it in proper doses. So, the bottom line is- do your research and choose the right hemp oil product to witness maximized benefits.